The International Bus and Coach of the Year Jury. Setra TopClass S516HDH front nearside. 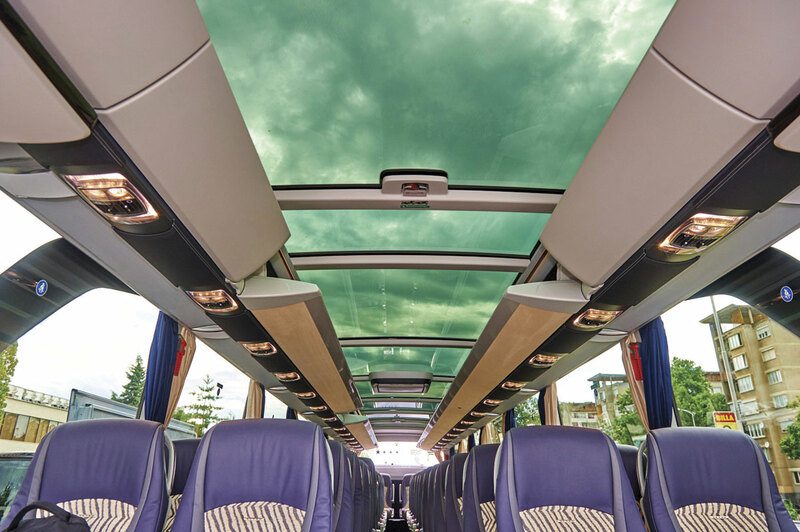 Setra TopClass S516HDH Sunroof ©Visavu. 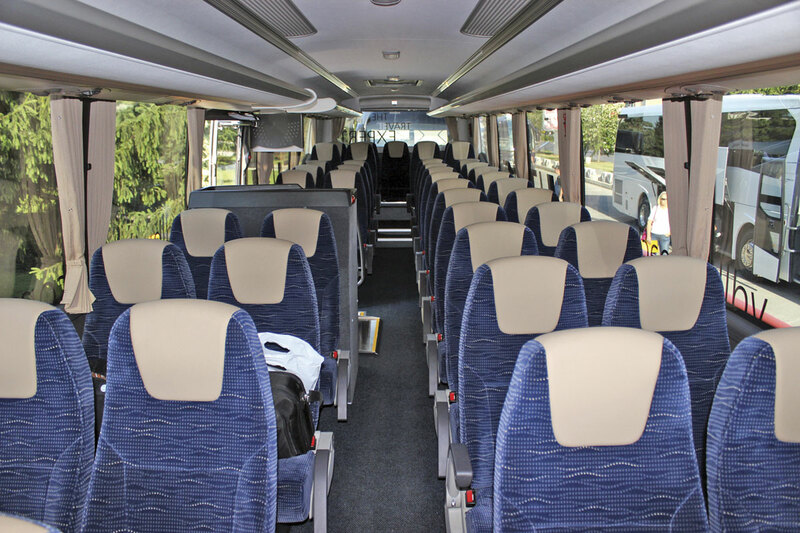 Neoplan Skyliner, lower deck ©Visavu. Iveco Magelys, front nearside ©Visavu. 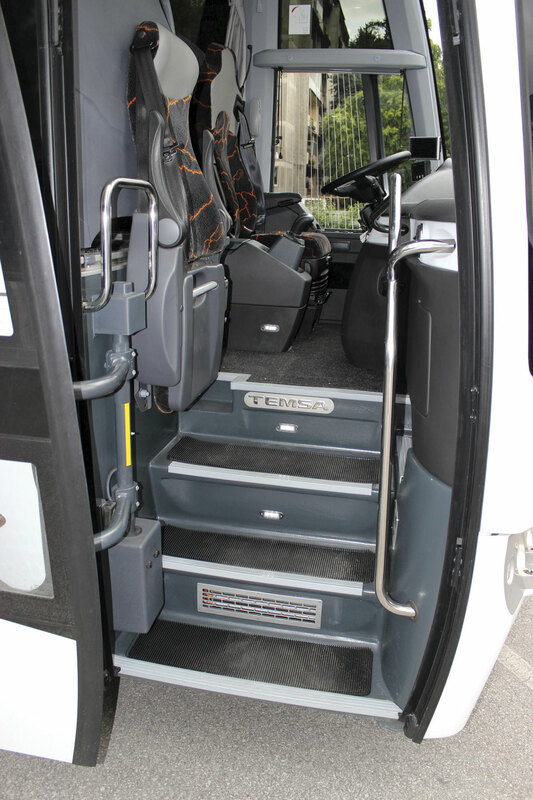 Iveco Magelys, table or wheelchair bay. Sunsundegui SC7 Volvo B11R, front offside. Sunsundegui SC7 Volvo B11R, front nearside ©Visavu. 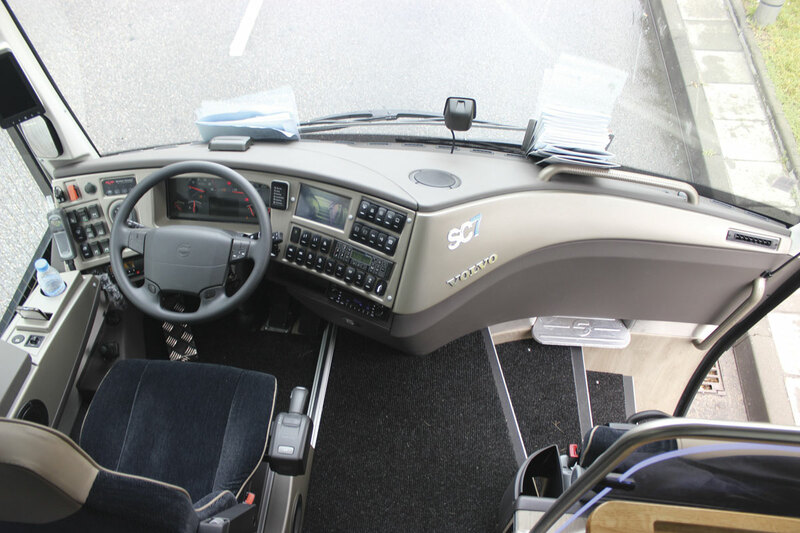 Sunsundegui SC7 Volvo B11R, interior. 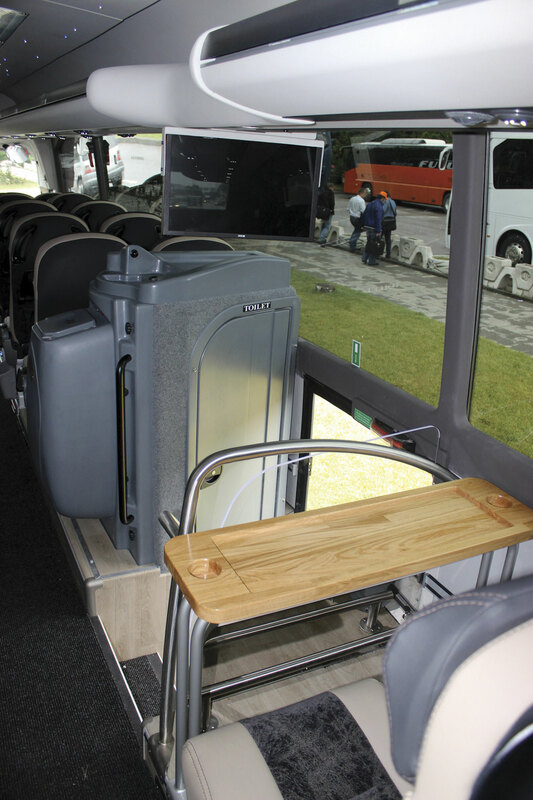 Sunsundegui SC7 Volvo B11R, emergency door, toilet and courtesy screen. Sunsundegui SC7 Volvo B11R, cab. 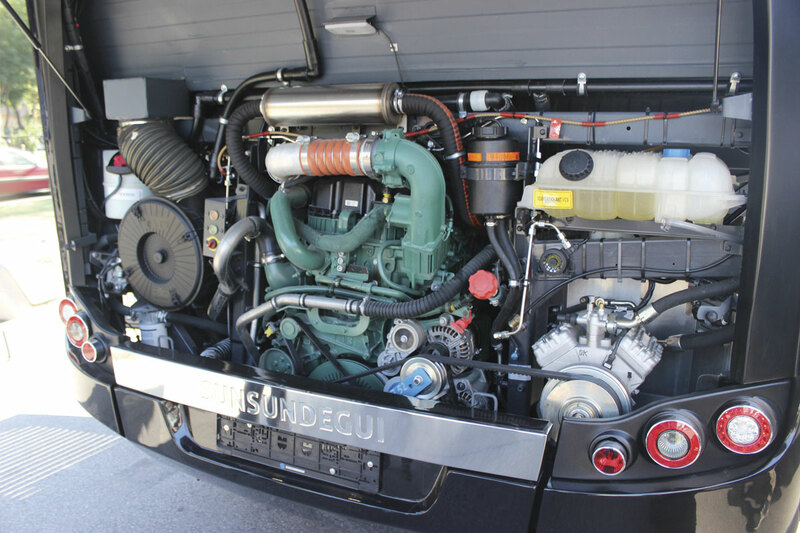 Sunsundegui SC7 Volvo B11R, engine. 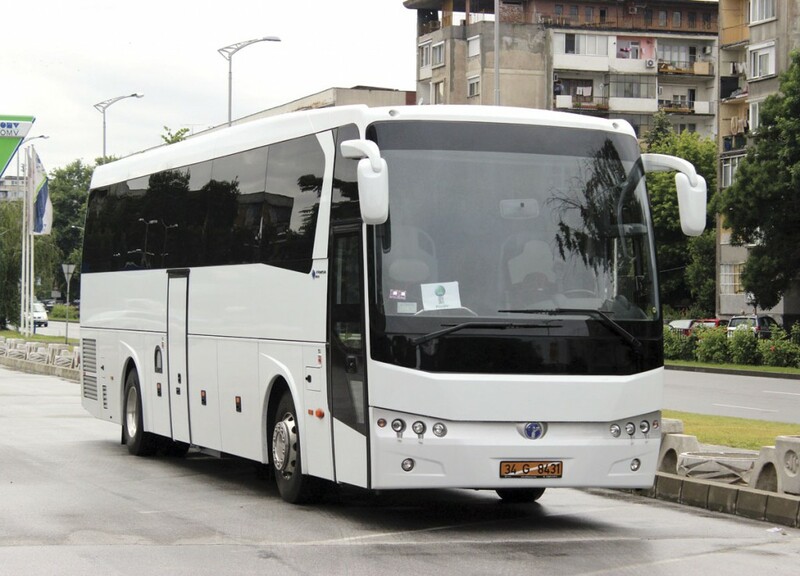 Sunsundegui SC7 Volvo B11R. rear. VDL Futura FMD2-129:370. front offside. VDL Futura FMD2-129:370, front nearside. VDL Futura FMD2-129:370, toilet, centre entrance ©Visavu. VDL Futura FMD2-129:370, cab, ©Visavu. Prior to Lachezar Apostolov, the Chief Editor of the Bulgarian magazines Kamioni and AvtoBusi, volunteering to organise the Coach Euro Test 2015 there, I confess I had never heard of the city of Plovdiv, which is remarkable, because it is the second biggest in the country and it pre-dates Rome, having been the capital of the Thracian empire. It will be the European City of Culture in 2019 and its selection for this honour is entirely justified. 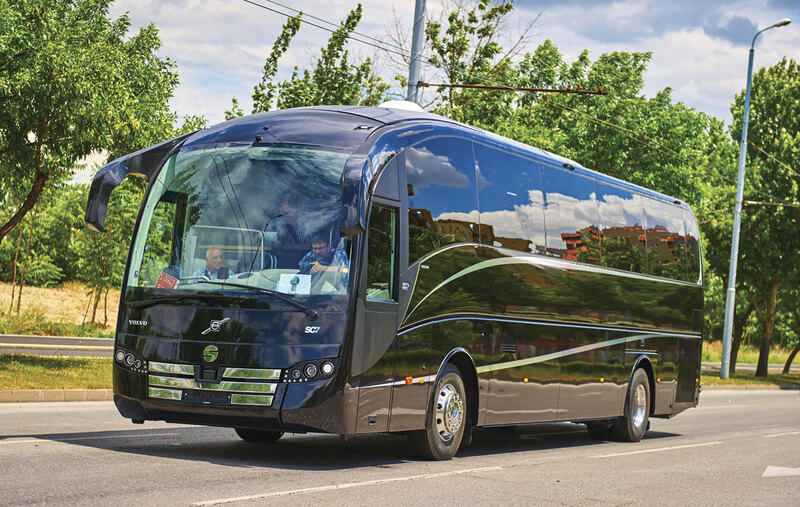 In contrast to the many ancient sites in Plovdiv, the task of the International Bus and Coach of the Year Jury was concerned with the latest vehicles available to the industry, though their ability to stand the test of time was part of the consideration. The specific purpose of the Coach Euro Test 2015 was to identify the International Coach of the Year 2016 from a strong field of six entries vying for the honour. 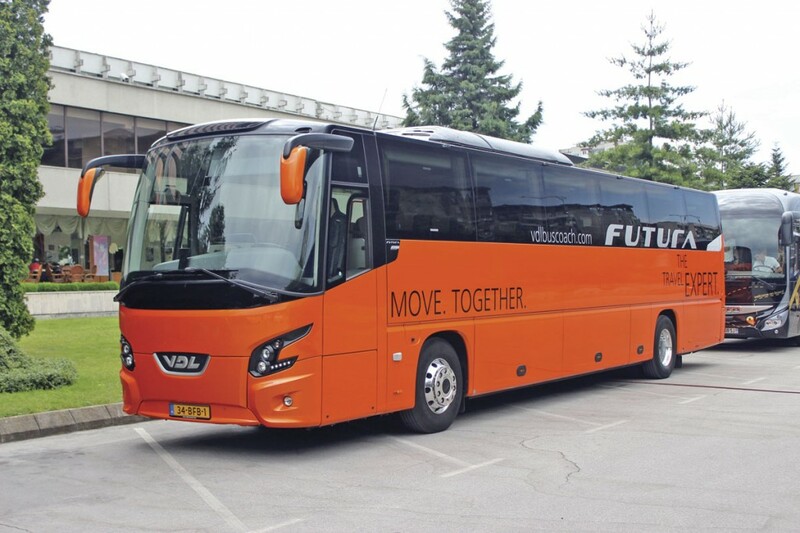 Made up of senior representatives from leading industry trade magazines hailing from 21 different European nations, the Jury uses the four day event to compare the different vehicles, including their performance on the road, and at the end selects a winner to carry the International Coach of the Year 2016 title. In making the decision, a host of different elements are considered including each coach’s performance in braking and acceleration tests, its handling on the road, quality, technical innovation, suitability for purpose, comfort, ease of maintenance, and a host of other factors, before voting takes place after lengthy discussions on the final day. Every manufacturer has ten minutes per vehicle to walk jurors round their coach to show them the key points and in addition they have a 20 minute presentation during which they are welcome to impart as much or as little information as they wish. It is one of the unusual and welcome aspects of the event that the representatives of all of the manufacturers are welcome to sit in on each other’s presentations and travel on each other’s coaches. 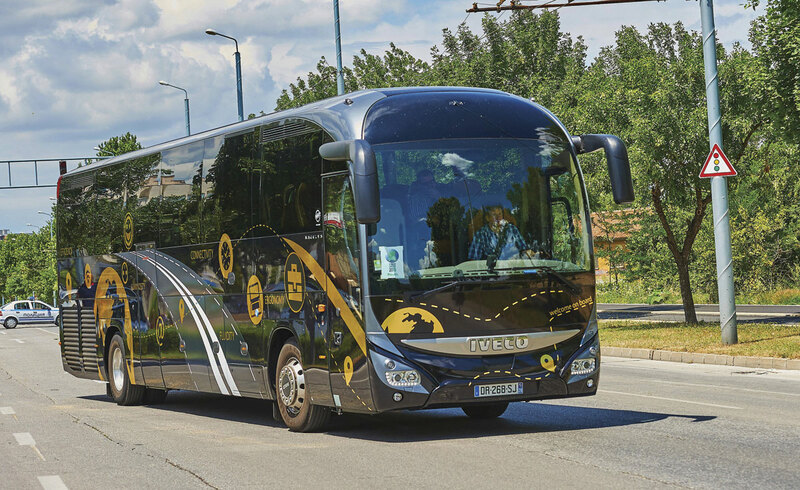 The Coach Euro Test alternates with the similar Bus Euro Test although while the bus award is generally presented during the IAA event in Hannover, the Coach of the Year is always presented at the Busworld exhibition in Kortrijk. 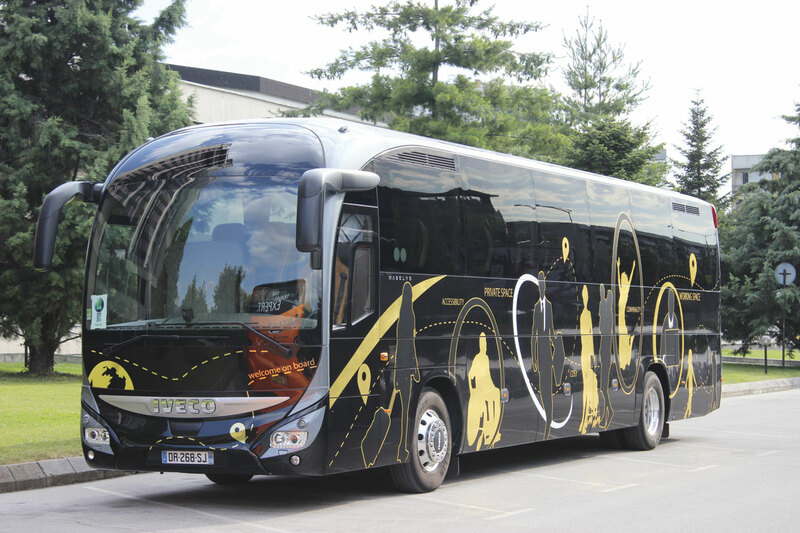 The Bus of the Year 2015 title was won by MAN with the CNG fuelled MAN Lion’s City CNG articulated after a Euro test staged in Lucerne, Switzerland, and the current holder of the coach title, the Coach of the Year 2014, is the Setra ComfortClass S515HD which was the winner of the competition held at Ybbs an der Donau in Austria in 2013. This year there were six very different candidates. All were left hand drive, though there is no bar to right hand drive vehicles entering and both Van Hool and Plaxton have entered right hand drive coaches in the past. Bulgaria is quite a distance for the participants to travel, but all made it safely to the base for the proceedings, the very comfortable Park Hotel Sankt Petersburg in Plovdiv. They were the: Temsa HD12; Sunsundegui SC7 bodied Volvo B11R; Setra TopClass S516HDH; Neoplan Skyliner; Iveco Magelys HD; and the VDL Futura FMD2-129/370. Although all of the jurors pay for their own travel, hotels and expenses, it would be difficult to organise such an event without sponsorship and the International jury is very grateful for the support given by regular sponsors Busworld and ZF as well as EuroPart, the city of Plovdiv and the Park Hotel Sant Petersburg together with the generosity of the proprietor of the local operator, Hebros Bus. Help from the local police included closing a road temporarily to enable the testing to be carried out. We certainly don’t get that everywhere we go. The method of revealing the winner has been changed this year after last year’s prematurely leaked result. As a consequence, nobody outside the jury will be told which coach has won until 31 August, when a press release will be issued. The award will be presented during Busworld in Kortrijk. Next year will once again be the turn of the bus with the Belgian capital, Brussels, lined up to play the host role under Didier Tuttyens of Transporama magazine. He will have to work very hard to create as warm a welcome as that we experienced in Bulgaria. 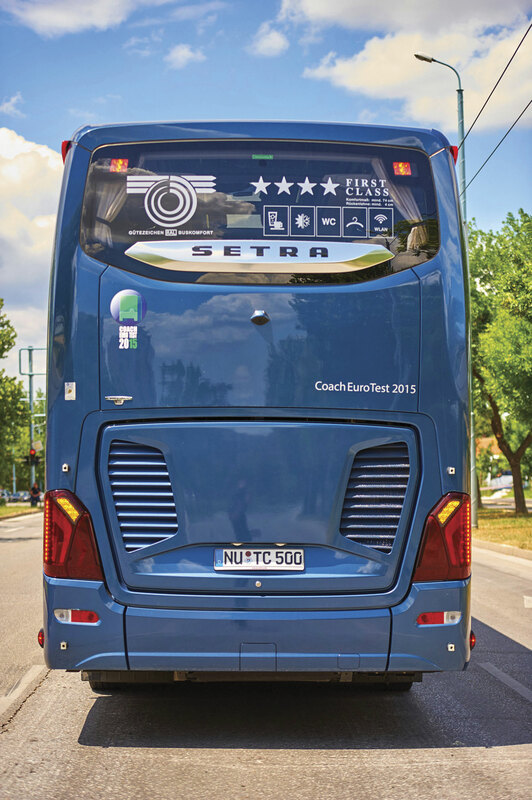 Readers will be tired of me telling them how wonderful the latest generation of Setra coaches is and then adding in the caveat that you can’t buy one in right hand drive, and that isn’t going to change any time soon, indeed it is unlikely it ever will. 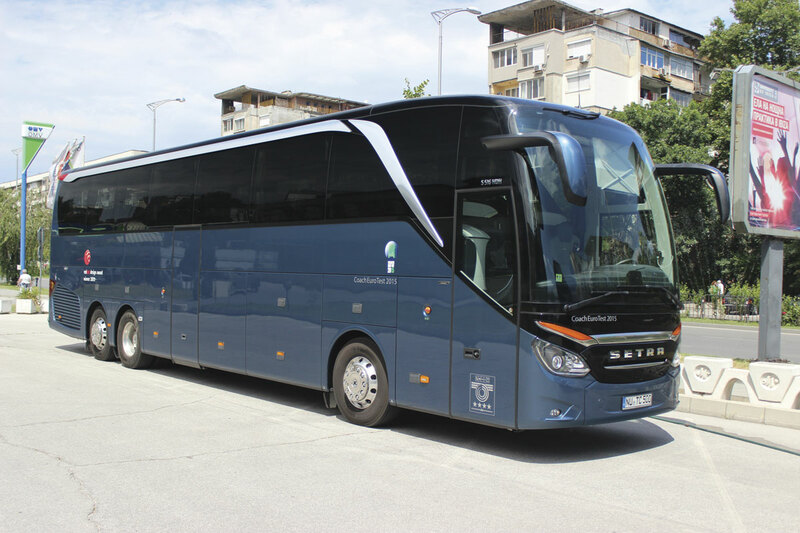 The ComfortClass is a very impressive coach that would be the flagship of most ranges but the TopClass family goes one better. It is offered only in three axle layout and there are a choice of three models. The S516HDH is 13,325mm long, 135mm longer than its 400 series counterpart, with an additional 200mm height in the 11.4 cubic metre luggage compartment which is shelved horizontally to prevent the crushing of cases at the bottom. 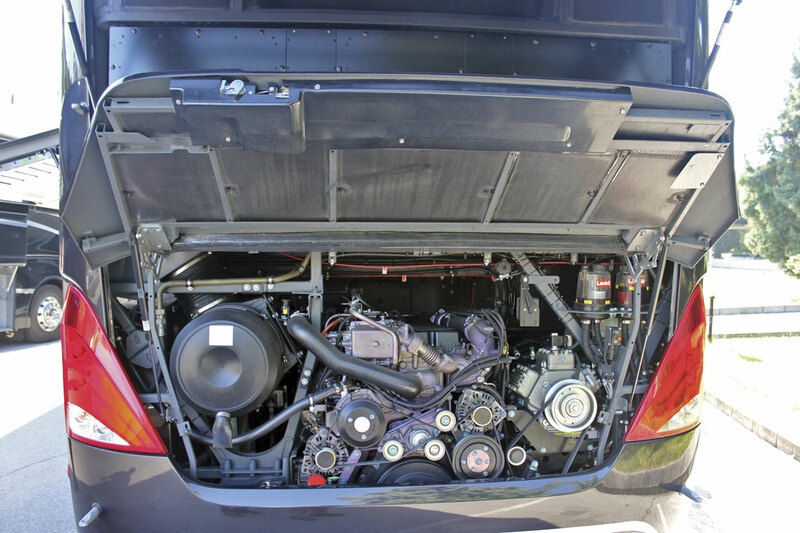 For Euro6, Daimler developed a completely new range of engines and this had the most powerful option, the 510hp/375kW OM471 12.8-litre which is smoother and more economical than its predecessors, using 40% less AdBlue. 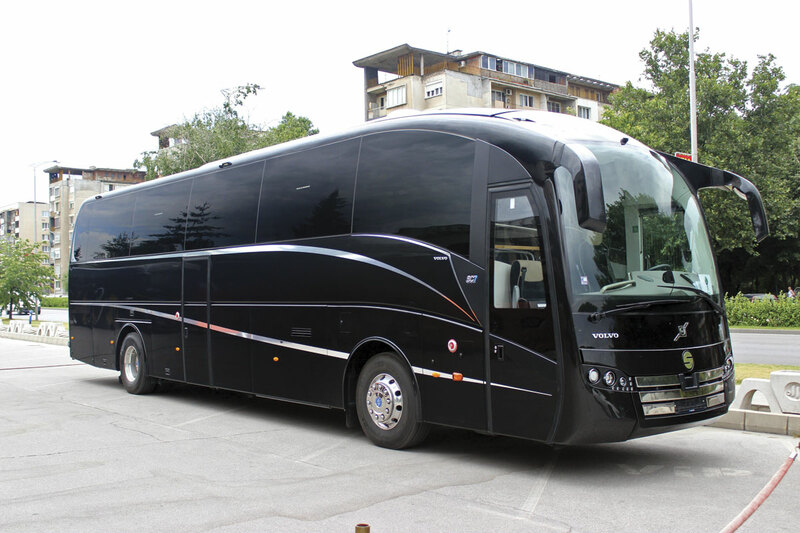 There are a number of options but this coach had it matched to the Daimler PowerShift 3 GO-250.8 eight-speed automated manual transmission, a combination that works perfectly together with virtually no vibration and in top (eighth) gear is doing 1189rpm at 100kmh. 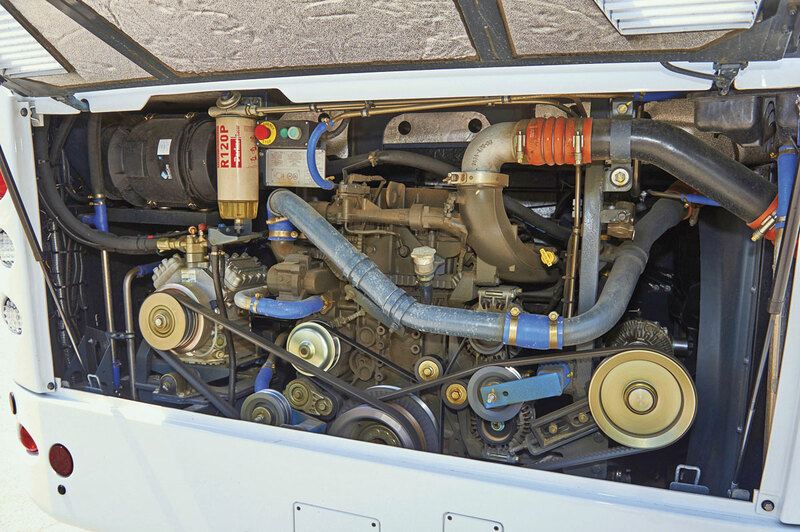 Predictive Powertrain Control (PPC), one of a very long list of acronyms you have to get used to in the Setra lexicon, reads the topography and programmes the Powershift 3 accordingly to the benefit of fuel consumption. In the braking tests, only the two-axle Futura decelerated from 80kmh to standstill in a shorter distance and nothing accelerated faster. Always at the fore with safety systems the TopClass already optionally embodied the new BAS Plus adaptive cruise control and active brake assist systems, ahead of their requirement, along with the ESP, ASR, BAS and Front Collision Guard (FCG). A TPMS system is an option while Start-Off Assist prevents rolling when pulling away on hills. Inside it uses high quality materials in beige and grey, such as a leather trimmed multi-function steering wheel and creates a feeling of spaciousness and brightness. 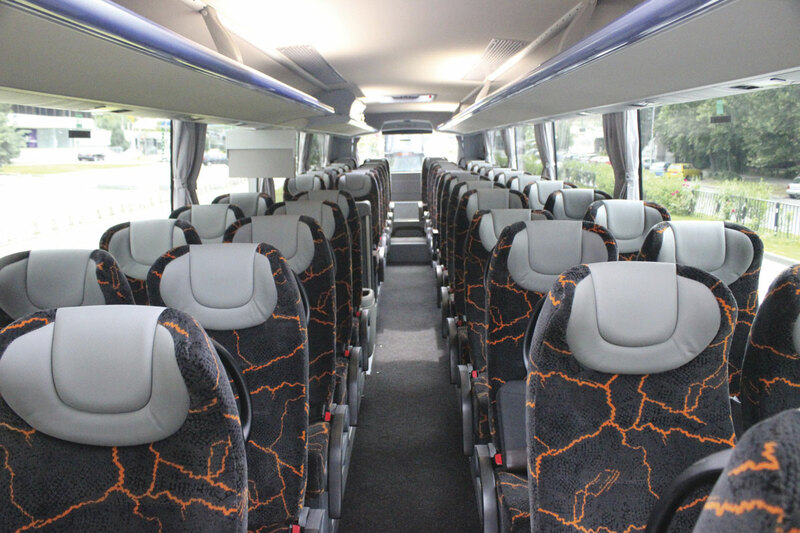 Typical of Setra’s attention to detail was the slight (5cm) offsetting of the ‘Voyage Supreme’ seats to give the aisle passenger a better view out. This was one area of the specification that did incur a degree of criticism as, although the old offsetting idea works well, a number of jurors would have preferred a seat that you sat in rather than on. There are other options, including a 2+1 arrangement that the criteria for the event prevented being entered. 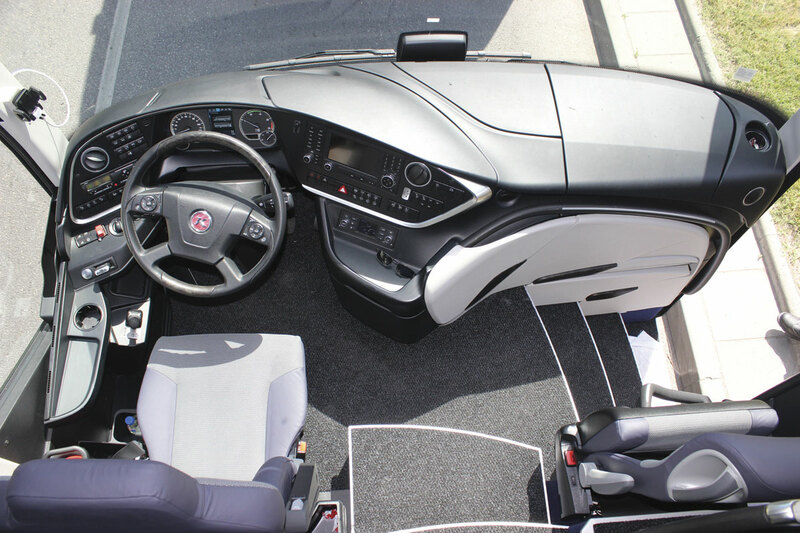 There are exclusive aspects that help justify the additional expense of the TopClass over the ComfortClass, among them the integrated air conditioning which has an air intake running the length of the vehicle behind the La Linea external styling feature and a heating function that assists in humidity control. Also new is a blown warm air system to prevent passengers getting cold feet. Three of the coaches entered had varying degrees of roof glazing but none as comprehensive as the TopClass which had the TopSky panoramic system which provides 13square metres of glazed area with a 1.2m wide glass section running most of the length of the coach. To cope with the additional heat generated by this glazing, the air conditioning has a 39kW capacity and because it is integrated does not require a roof pod. It’s a little thing, but one of the jurors noted that it was only the Setra (and the Temsa) on which the windscreen wipers were silent in operation. All of this opulence does come at a price; indeed it was over €120,000 more than any other single deck participant and, at €420,000 net, exactly twice the cost of the Temsa, which does raise questions in terms of relative earning potential. It is, however, surprisingly economical having returned 23.6litres per 100km (11.97mpg) for the non-motorway unladen drive from Germany to Plovdiv, figures in line with German press test findings. 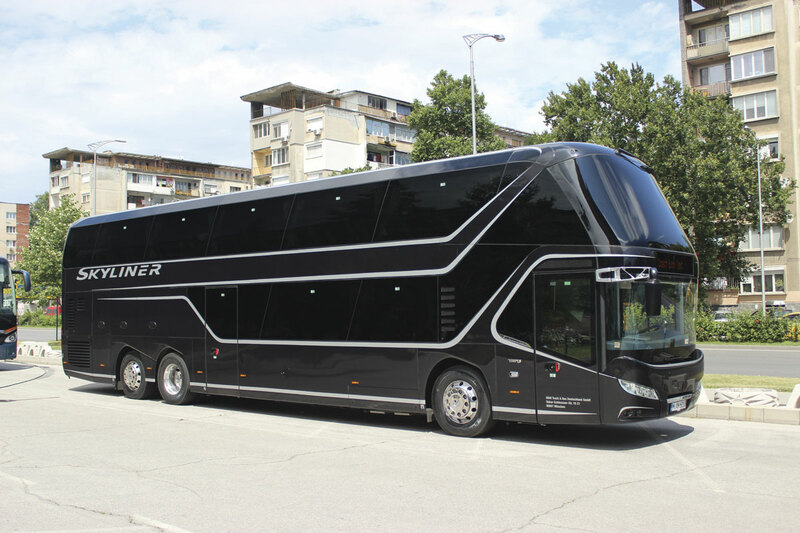 There have been a couple of false starts for what is now undisputedly the flagship of the Neoplan range with the discontinuation of the Starliner. 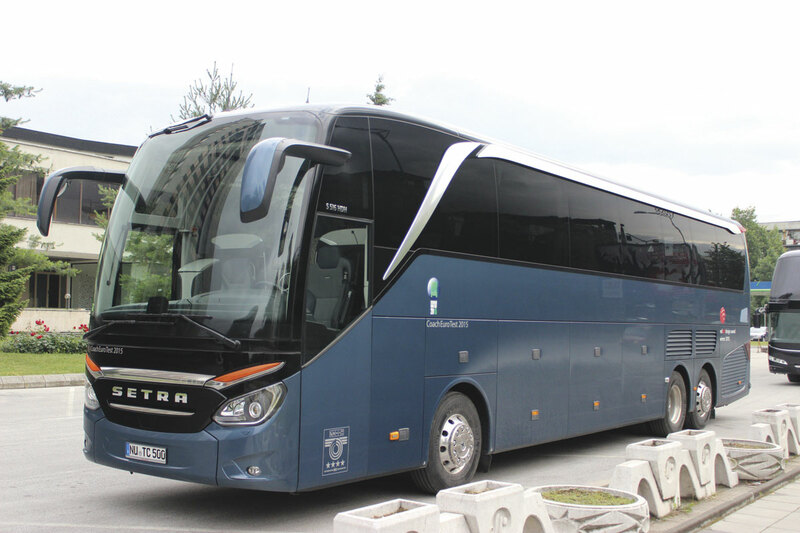 After a two year delay as a result of the failure of Viseon, who were building the Skyliner for MAN, it is now to be built at the MAN plant in Ankara where all MAN and Neoplan coaches will be constructed. It is a visually stunning piece of automotive sculpture with a huge amount of on road presence. The 505hp D2676 engine delivers 2,300Nm of torque via the MAN TipMatic (ZF AS-Tronic) transmission. Designing a double deck coach that does everything you want it to do within the confines of an overall height of only 4m is massively difficult and every such vehicle I have ever seen has involved compromises. 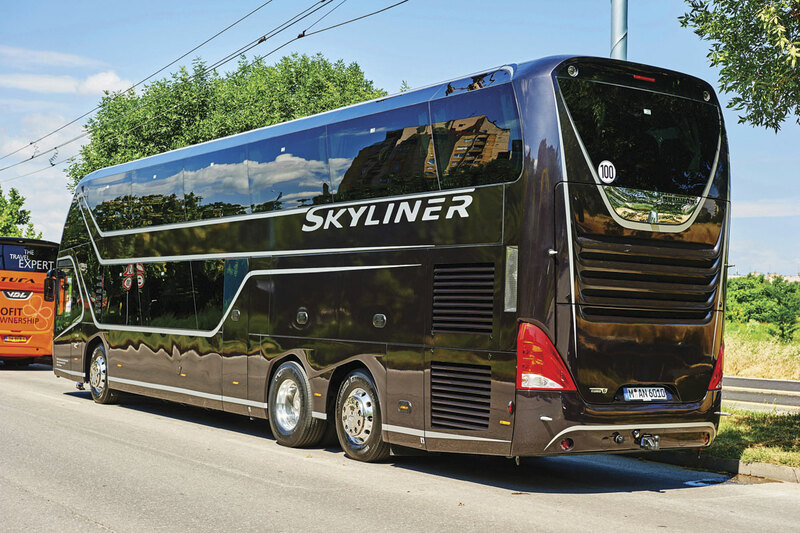 Often it is the luggage capacity, which can be paltry given the number of passengers carried, but that is not the case on the Skyliner which has a class leading 11 cubic metres. The downside to this is that the front overhang is foreshortened and the cockpit is consequently slightly smaller than you’d expect, while the front staircase was, for me at around six feet tall, difficult to negotiate on the way down. You get to the bottom of the stairs and you are staring at a blank panel, trying to work out which way to contort yourself in order to get past and on to the lower deck without bashing your brains. It is a shame, because there is so much about this coach that is good. 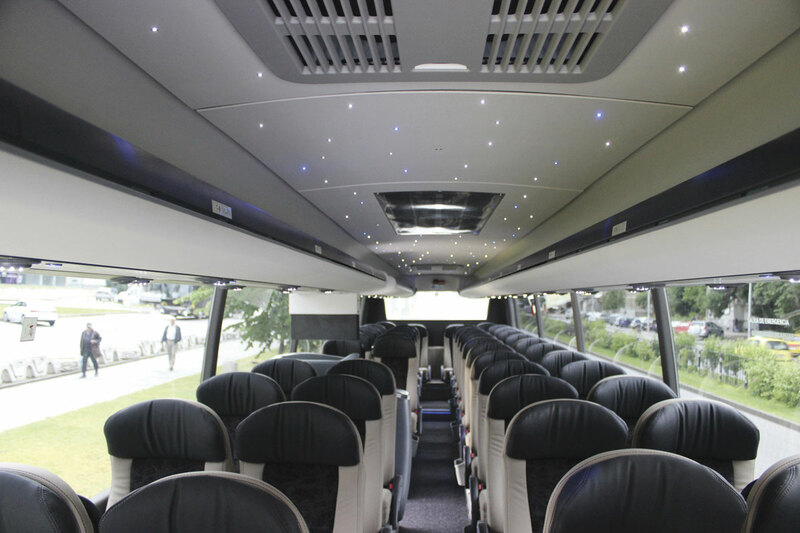 It looks and feels classy inside and out, the finish is excellent, and in the four star execution entered the seating capacity using Exclussivo Plus seats is 76, 56 of them on the top deck. 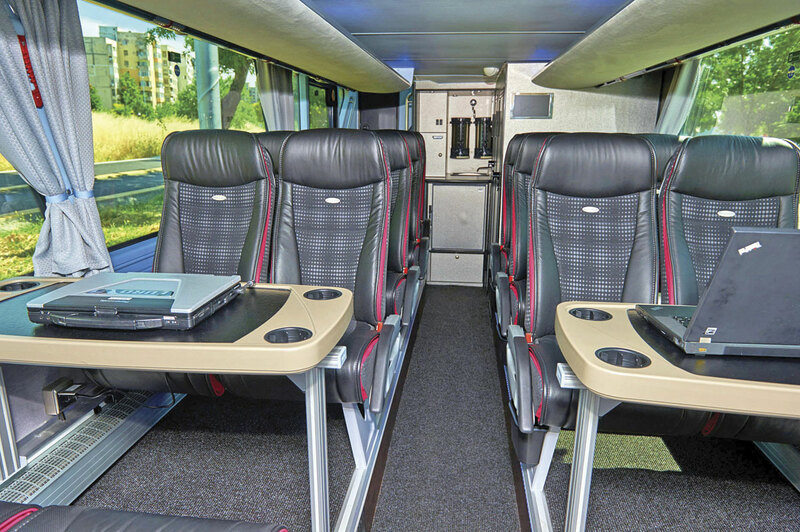 Three-star specification allows you 83 seats while five-star limits it to 68. Glazed roof sections on the upper deck help keep it light and spacious in feel, though cleaning them can’t be easy. The big thing the Neoplan team stressed to me was the air conditioning system, something notoriously difficult to get right on a double deck. They have scrapped the Skyliner’s earlier system and started again, increasing the capacity to give a cooling output of 56kW and a combined heating output of 96.6kW. The dual zone system completely separates the upper and lower decks depending on how it is set. With no internal channels as the air comes directly in, it can deliver up to 100% fresh air, though obviously if you are on a skiing trip you would use a re-heat function. 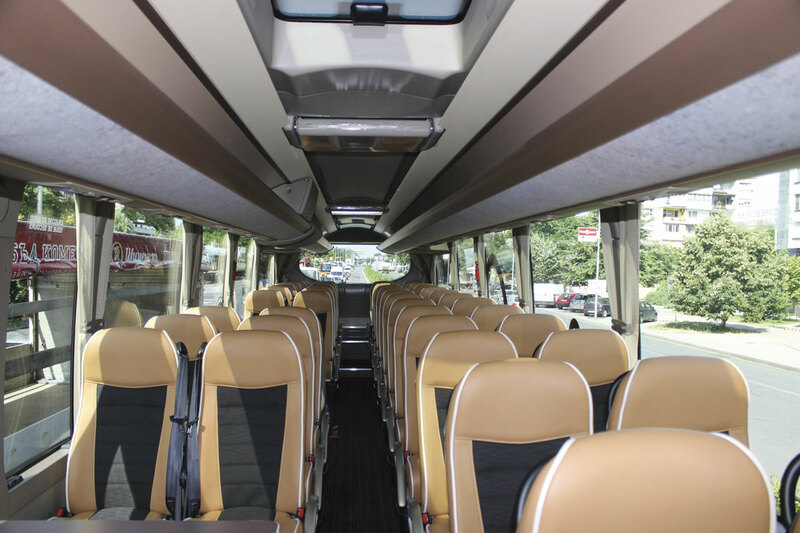 Also new is the CDS (ComfortDrive Suspension) active electronically-controlled system which successfully ensures that the coach does not lean as much it otherwise would, helping to keep the ride smooth for passengers and reduce wear on components and road surfaces. I found the quality of the ride on the upper deck good on some of the worst roads you will encounter in Europe. We travelled on the Skyliner far into the countryside for one of the evening dinners and had to detour in places to avoid roadworks. It coped with it all and proved exceptionally manoeuvrable in the process, a credit to the coach as well as its driver. 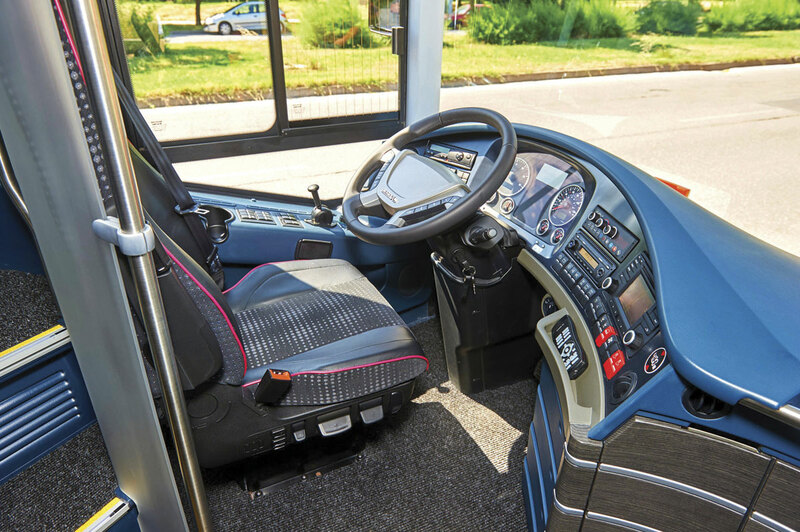 There were criticisms of the lower deck noise, often an issue on double decks, and the driving mirrors, the latter a point that Neoplan is working on. They also have plans for a nearside staircase. MAN confirmed that they would not produce the Skyliner in right hand drive form unless they could see a reliable future for around 30 units a year, but for band bus type applications would be happy to supply shells either for local completion or completed at Plauen in left hand drive. It is easy to forget that Temsa has only been building coaches since 1987, launching the Safari, which the HD12 has replaced, in 2001. Earlier this year it unveiled its first all electric vehicles at the UITP event in Milan. 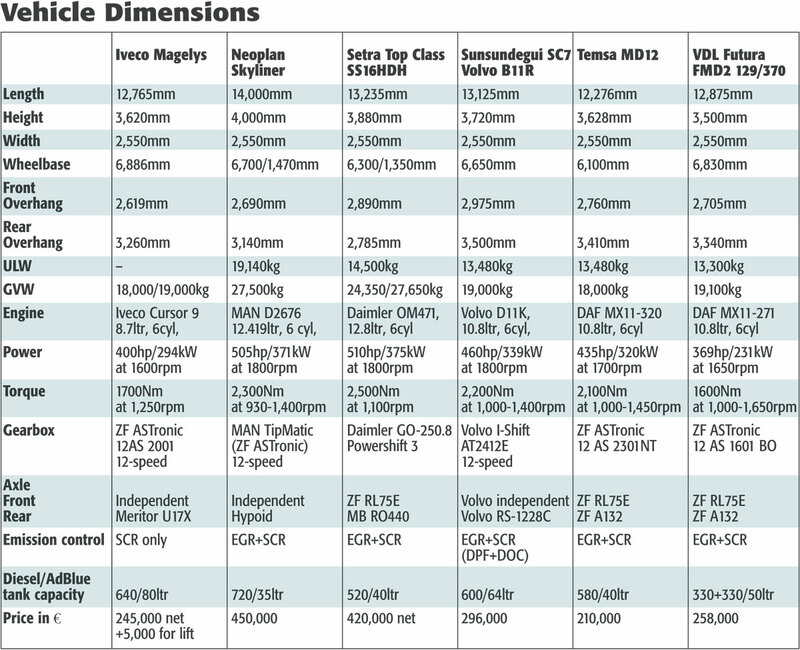 Offered in lengths of either 12,276mm or 13,076mm on two axles, the HD 12 and HD 13 are both 3,625mm high and currently represent the top of the Temsa range. 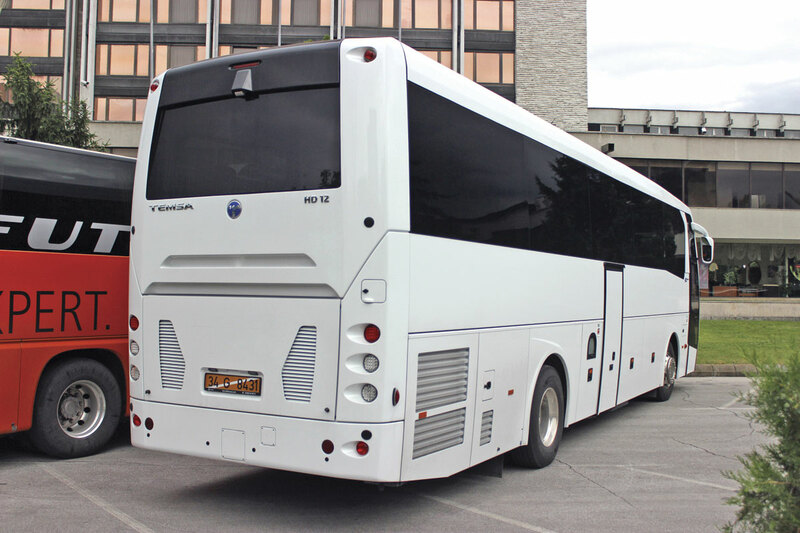 With, by some margin, the lowest cost price of any of those present, the coach entered was a stock vehicle for the German market finished in unrelieved white. This did not make the most of its design in the way that the other candidate’s presentation did but nevertheless it has an appearance that manages to be distinctive without being over complicated. 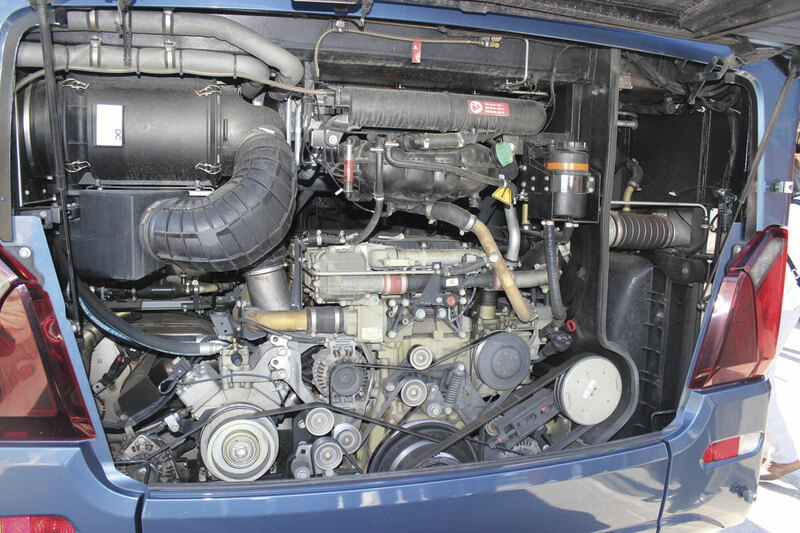 Perhaps surprisingly, it was fitted with the 435hp version of the 10.8-litre DAF MX11 engine which gave it 66hp more power than the longer but similar weight VDL Futura FMD2 with the 369hp variant of the same power unit. This was linked to the ZF AS-Tronic 12AS2301NT 12-speed automated manual transmission, though the matching was less honed than on the other coaches and the driveline noise reaching the saloon was greater. Acceleration, especially low down, was swift and only the Setra and VDL stopped in a slightly shorter distance. An issue with the cruise control was that there was no light to indicate when it was on. In terms of specification, it will be the beginning of 2016 before it can be offered with a lane guard and brake assistance systems. Presented with 50 Inova Agile 4540 reclining seats with side-slide mechanism and two-point belts and trimmed in Epengle moquette with leather headrest covers, the interior was simply finished and not unattractive though some of the materials used were slightly plasticy (a word you will understand, even if my spellchecker doesn’t). At the rear there were four rather than five seats, though they were arranged with an empty space in the centre rather than being re-spaced to give the passengers in the rear corners greater shoulder room. The specification included a relatively small centre sunken water flush toilet with quite a difficult lipped entry and a front dash mounted 42-litre fridge. The entertainment system provided was a Bosch Professional Line radio, DVD and MP3 combination with two 19inch monitors, the centre one being a fixed unit while that at the front was powered. On the road, though the ride quality was generally good, there was quite a degree of noise, especially at the rear. 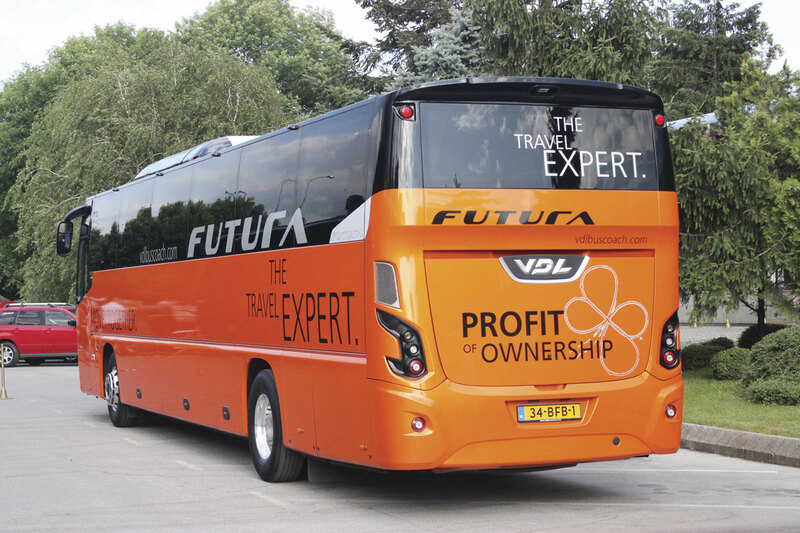 It did not have the level of specification nor the host of innovations that some of the coaches demonstrated did, but it was an honest and functional coach, well capable of doing a job at a price that might enable an operator to make a profit in a competitive market. I’m not sure whether I understood him correctly or not, but one of the Temsa representatives appeared to indicate that we can expect a new ‘upper-segment two-axle’ Temsa coach at Kortrijk which might well be one to watch at the next Coach Euro Test. In some ways the Iveco Magelys is not new as the Magelys family was originally launched back in 2007 under the Irisbus brand, but in other ways this latest version with ‘silver smile’ brand signature front was a revelation. Offered exclusively on two axles, it can be supplied in lengths of either 12,200mm or 12,765mm, with the longer version entered in Plovdiv. Like the popular Crossway range beneath it, it has a structure corrosion protected by a full emersion cataphoretic dip process. Iveco claim the Magelys HD is suitable for a wide range of roles from medium and long distance tourism to national, regional and international express lines and the coach entered was specifically equipped for express work with a cassette lift on the nearside in the second bay beyond the entrance door. In the corresponding section of the interior, the second seat is reversed to face the rear and a table with folding side wings on tracking with quick release fittings can easily be demounted to accommodate a wheelchair. 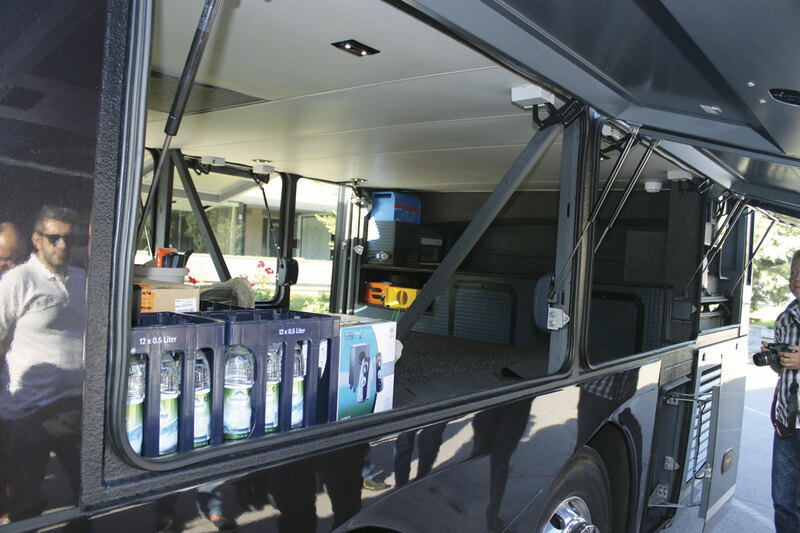 The lift, a 350kg Dhollandia unit, was fitted within a cassette that was mounted in the floor of the luggage compartment across the width of the vehicle, slightly reducing the available luggage space from the maximum of 10.8 cubic metres possible when a toilet is installed. The saloon floor does have a slightly sunken aisle so wheelchairs can only be located on the nearside. 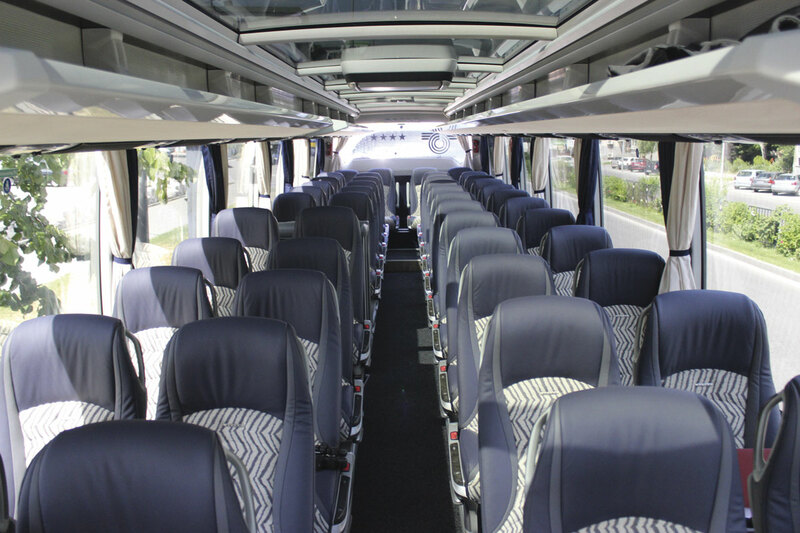 Although a maximum of 59 coach seats can be fitted, Iveco’s standard for international line work is 46 (with a four seat back row) and it was in this layout using Kiel units that it participated. 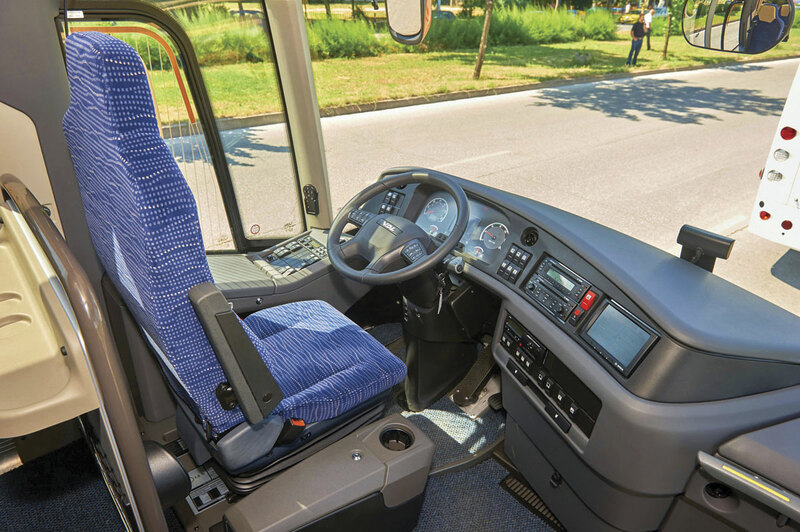 There are options for additional tables to be added as well as other manufacturer’s seats, with around 50% of production supplied with Iveco’s own seat design. Trimmed in a tan coloured leather with contrasting dark centre sections, white piping and ‘Welcome Aboard’ stitched into the cushion of every squab, the seats matched the brown shades of the interior mouldings that illustrated Iveco’s ‘no grey’ concept which successfully gives the interior a warm and inviting look. Saloon headroom is generous at 2,100mm (the same as the Setra) and an attractive novelty is the way in which the racks are mounted inward of the vehicle sides enabling the passenger alongside to stand up unhindered and the installation of roof edge glazing as standard, something that Iveco claims adds 35% more light to the interior; it certainly gives an excellent view when sightseeing. For an additional cost of around €3,000 you can have a fully glazed roof, but few operators specify it because of the cleaning challenge it represents. Welcome in all applications but perhaps especially so on express services was the entertainment system which delivered 250 different movie choices to customers. Alone among the vehicles entered Iveco has opted for SCR only (without EGR) to meet the Euro6 emissions requirements utilising the 8.7-litre FPT Cursor 9 unit rated at 400hp/294kW and delivering 1,700Nm of torque. This was over two litres less than any of the other candidates and only two-thirds of the capacity of the Setra, and though drivers commented that it felt powerful on the road, the acceleration figures indicated that it was slower to gain speed than the other two axle coaches. Along with four of the six candidates it was matched with a version of the ZF AS-Tronic automated manual transmission though this reacted more slowly than in some other applications. 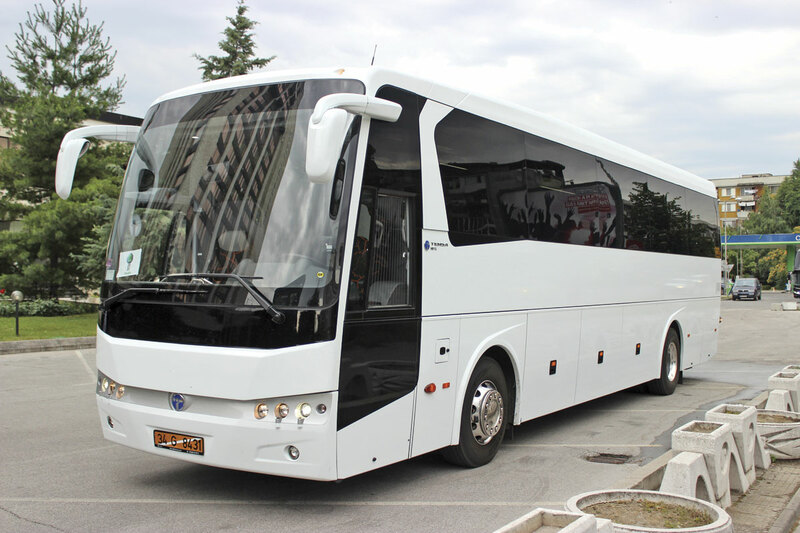 Reflecting the increasing dominance of integrally built coach products in Europe, the Volvo B11R Sunsundegui SC7 was the only body/chassis combination participating in the event. Only this coach and the Temsa were models that are offered in the UK, albeit with the steering wheel on the other side. It was entered by Sunsundegui, the Spanish manufacturer, based at Alsasua in Navarre, which has a close and longstanding relationship with Volvo and was taking part in the Coach Euro Test for the first time. 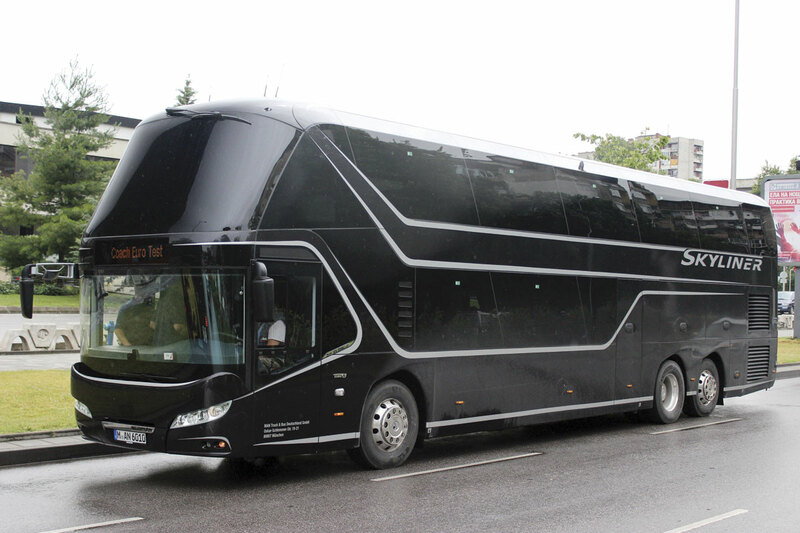 They had risen to the occasion and demonstrated their premium SC7 product with a number of innovations, many of which I have not seen on coaches supplied to UK operators, demonstrating the extent to which they can deliver bespoke products in the process. One technical aspect of note is that the stainless steel structure already meets the enhanced ECE R66.02 rollover requirements that will come in 2017. The B11R chassis is one that readers will already be familiar with. With the rationalisation of the range at Euro6 it is the more powerful of the two chassis options now being offered, featuring the six-cylinder D11K, 10.8-litre, common rail engine with a choice of 380hp, 430hp or 460hp power outputs, the Plovdiv coach having the largest of these, delivering it at 1,800rpm along with torque of 2,200Nm at 1,000-1,400rpm. It uses both EGR and SCR technology to achieve Euro6 emission standards with a diesel oxidation catalyst (DOC), automatically regenerating diesel particulate filter (DPF) and Amonia slip catalyst contained within a single muffler unit. 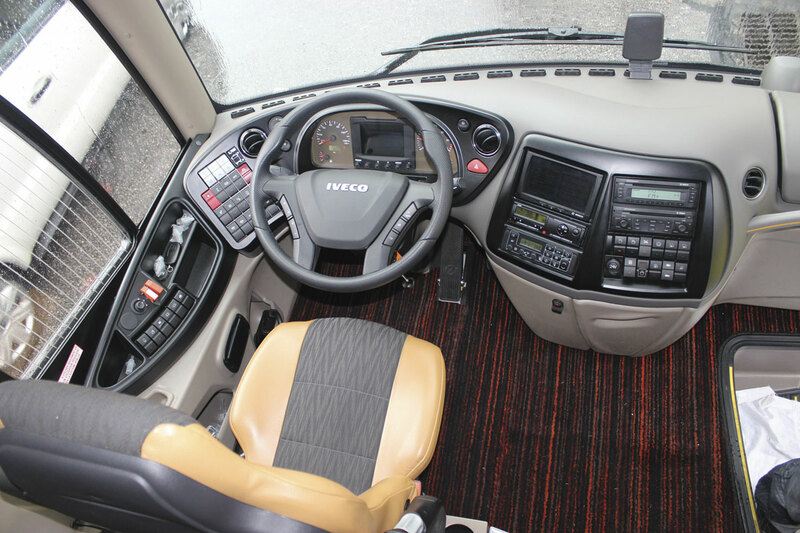 The transmission was Volvo’s own 12-speed automated manual I-Shift system. Fuel tanks, which fill both sides, held the standard 600 litres, though a 720-litre option is available. The engine bay is protected by a Fogmaker fire protection system. Among the interesting aspects were the use of double tinted double glazing that Sunsundegui argue makes curtains unnecessary. The exterior mirrors, which are heated and electrically adjustable, fold round in an impact, and, as we saw on our recent SC5 evaluation, there is an additional blind-spot mirror mounted internally on the offside A pillar. Providing a respectable 11.10 cubic metres of luggage capacity, the main hold has pneumatic doors with a sensitive lower edge that automatically re-opens them if any kind of obstacle is encountered. A Brigade 360 degree camera system utilises four cameras to give a bird’s eye view and there is a reversing camera facility and a new boarding camera. 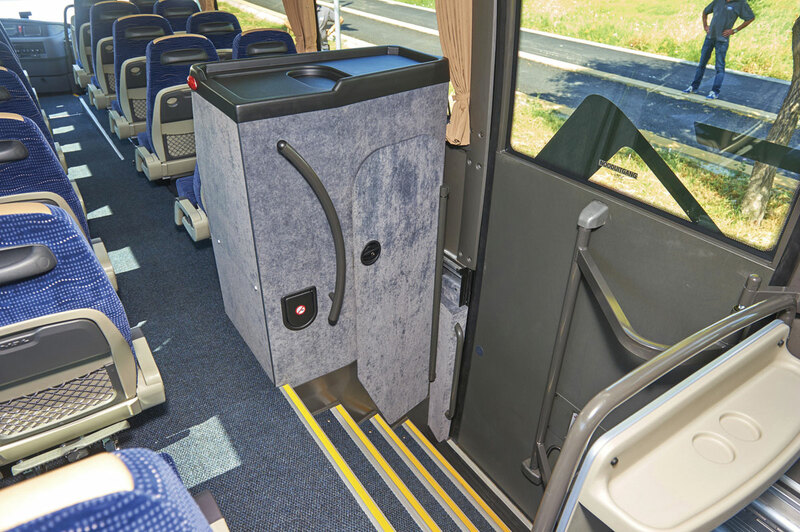 In the interior, which featured comfortable Kiel Avance 1030 recliners (different from the 1020 in having a slide-up headrest), with a USB facility on every pair, the rack edges were equipped with seat numbers duplicated in Braille for blind passengers. Also of interest was the optional Azimut system, which provided every passenger with the opportunity to watch their choice of film on their own tablet device, supplied via a Wi-Fi network, which is how I came to be watching ‘The Life of Pi’ while touring the streets of Plovdiv. Other interesting options included decency partitions with wooden upper tray sections and an attractive lighting feature that illuminated the Sunsundegui name and emblem as well as a special ceiling treatment incorporating a host of tiny blue and white lights incorporated within it. Opinion was divided on whether the fridge built into the underside of the driver’s seat was a good innovation or not. Unlike most of the other participants, the vehicle was not equipped with the new brake assist and lane warning systems that will be a requirement from November, though Sunsundegui has designed the body to accept them without adaptation. I understand that a vehicle equipped with the systems is currently under test. Jurors liked the way the coach drove, praised its performance on rough roads and liked the gear change. There were some issues with the cruise control, wipers and retarder that proved difficult to rectify locally. 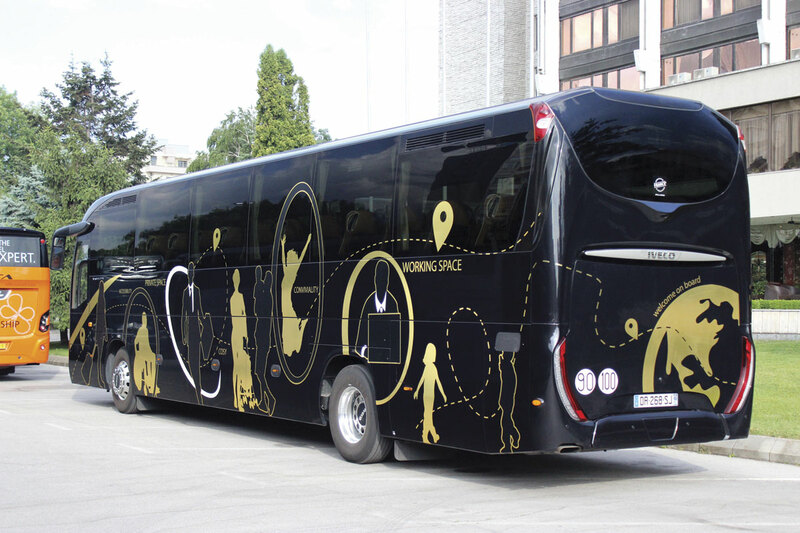 Although the price of the coach shown was €296,000, we were told a version without all the additional optional features would have cost only €230,000. 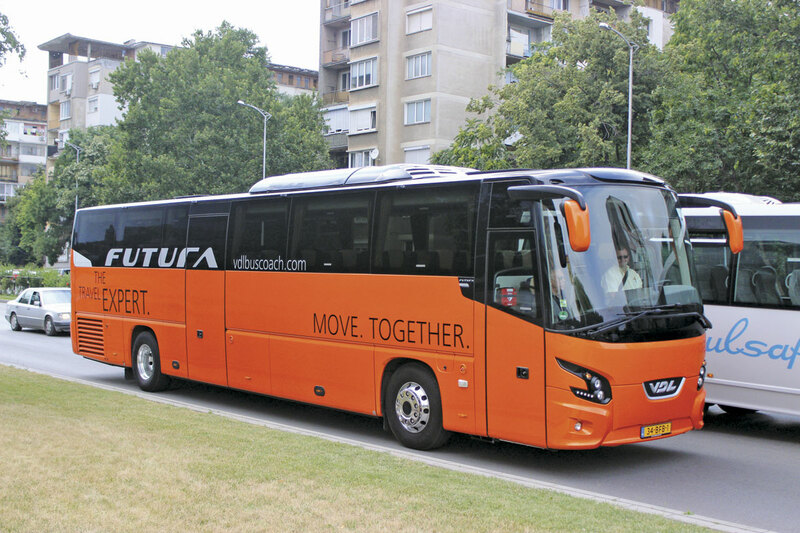 VDL has enjoyed considerable success in both the Bus and Coach of the Year events and for a year in 2011/2102 held both titles after the success of the Citea SLF in 2011 and the Futura FHD2 in 2012. This time it entered the latest addition to the Futura range, the Futura FMD2 which effectively replaces the old Futura Classic FLD. Conceptually, VDL has adopted the same low weight, aerodynamic shape philosophy and used ‘A-brand’ component suppliers including ZF and DAF. The FMD2 is offered in two lengths on two axles, either 12.195mm or 12,875mm with wheelbases of 6,150mm or 6,830mm. 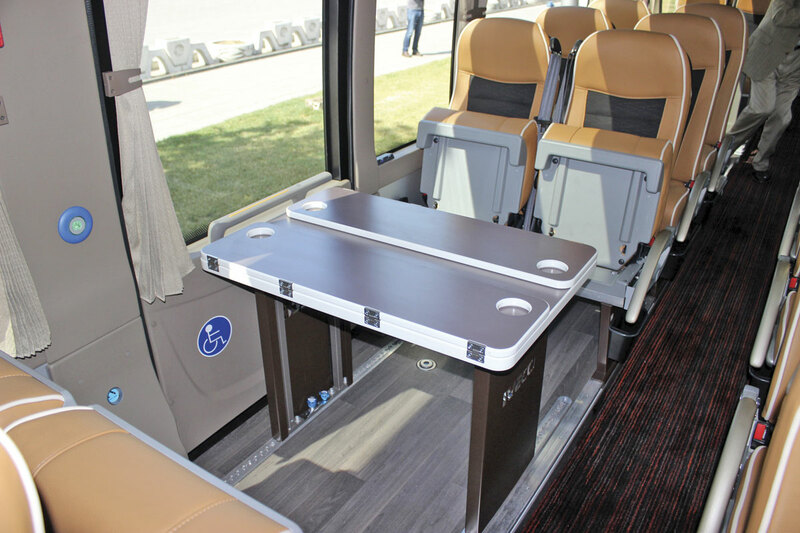 Participating in Plovdiv was the longer model equipped with 49 Class 100 recliners with side-slide and a USB connection at every seat, a Caroil cassette lift mounted at the centre door and centre toilet. Although not advertised, longer variants have also been built for established customers. 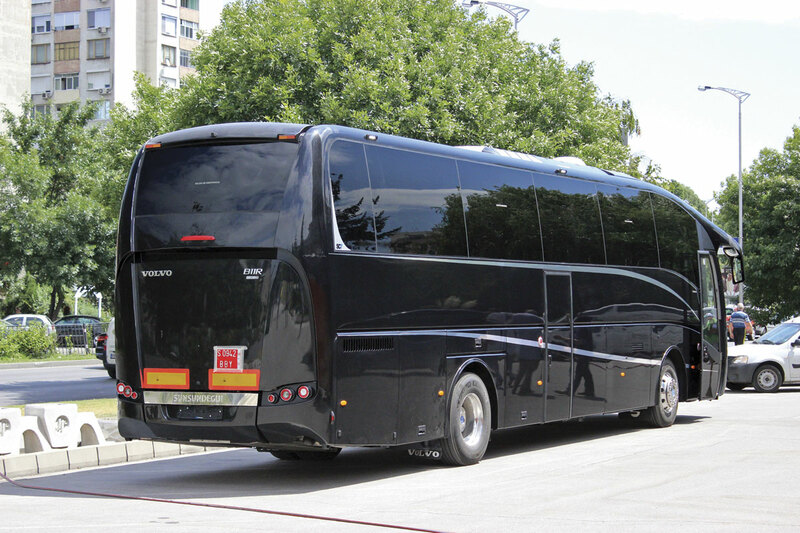 Greatly similar in appearance to the higher floor FHD2, the FMD2 is distinguishable from the coach proving so popular in the UK not only by a reduction in height of 200mm, all taken from the top of the luggage compartment and characterised by a reduced distance between the top of the wheelarch and the main side panel, but also by the use of black rather than silver for the mirror backs and light unit surrounds. The dimensions of the flat floored passenger compartment are exactly the same, with a main aisle to ceiling height of 1,940mm and a deck height of 1,250mm luggage capacity with toilet and standard door is 8.1 cubic metres, increasing to 9.8 cubic metres without the toilet. Using VDL Class 90 seats enables a maximum of 59 passengers to be carried, in which layout it has a minimum seat pitch of 700mm. The coach entered had the Class 100 seat. 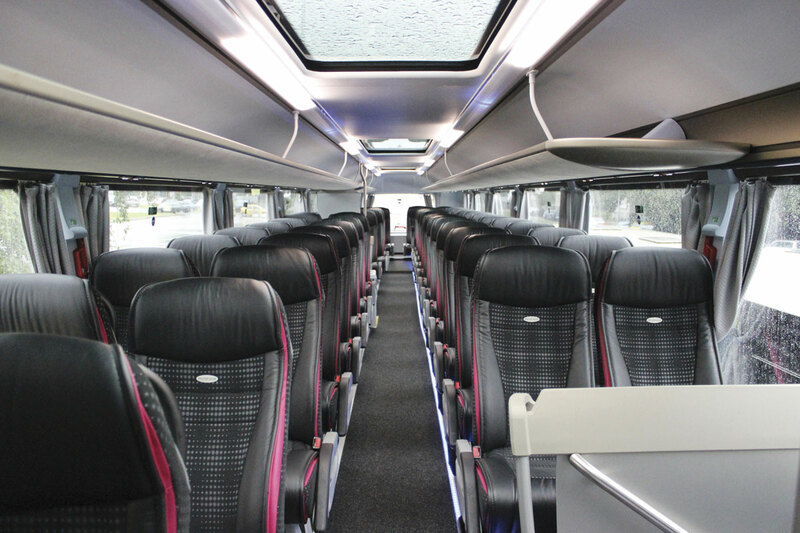 Internally, it maintains VDL’s custom of looking smart and modern by using quality materials and keeping the finish simple and uncluttered, though with a leatherette trimmed ceiling rather than the moquette of the FHD2, PVC side casings and direct rather than indirect lighting. Two centre door widths are offered, the wider one enabling a lift to be installed. The driveline utilises the DAF MX11 unit rated at either 330hp/240kW or, in this case, 370hp/270kW and delivering torque of 1,600Nm. Manual, automated manual or fully automatic ZF transmissions can be specified. The coach entered had the ZF AS-Tronic 12AS1611BO with a rear axle ratio of 2.93:1 meaning that it was doing 1,200rpm at 62mph/100kph. VDL had put in a lot of work on optimising the AS-Tronic to very good effect as it stood out in this respect. Over 120 have been built to date (including a batch of ten three-axle 14.8m 61 seaters with lifts) and though there is theoretically no reason why the Futura FMD2 could not be offered in the UK in right hand drive form, it is extremely unlikely it ever will be. I understand there is no interest from the associated Moseley group of companies in doing so. It must cost virtually the same to build so the retail price difference compared with the FHD2 cannot be massive. Arguably, there is no real niche for it crying out to be filled, unless your depot has a low roof. It does enable a centre door lift to be installed in conjunction with the wide door option but this is not a concept favoured in the UK for express work, most opting for the front door lift.